Most of us will carve a few angled shapes into a pumpkin and call it a day—but there are artists who do amazing things with pumpkins, carving detailed faces and scenes into these members of the Cucurbitaceae family to create one-of-a-kind sculptures. Here are some of our favorites. Noel Dickover, who started carving pumpkins in 1997 after his brother found an old pumpkin carving guide, specializes in Jack O’Lantern designs featuring pop culture figures from science fiction and fantasy. His Death Star pumpkin was so popular that he created a tutorial so Star Wars fans could carve it themselves. He's also tackled Game of Thrones, as you can see from the white walker-adorned Jack O’Lantern above. You can find more of Dickover’s carved pumpkins at Instagram. According to her website, Nalini Asha Biggs has been using pumpkins as a canvas since she was 7. The artist and filmmaker has gotten pretty good at it, as you can tell from her carving of Nick Kroll and John Mulaney as the characters George St. Geegland and Gil Faizon (currently appearing in Oh, Hello on Broadway, the actors originated the prankster characters on Comedy Central's Kroll Show). Biggs has carved everyone from Calvin and Hobbes to Will Ferrell as Anchorman's Ron Burgundy into pumpkins; the realistic carvings look like they could jump out and yell "Boo!" You can see more of her work in her Facebook gallery or on her website. DeviantART member Simon Patel is a British wood carver and seasonal pumpkin artist who, according to his Facebook page, has "over 10 years experience in hand carving and chainsaw carving." He's turned pumpkins into wrinkled old folks, goofy goblins, and several kinds of skulls, like the ghoulish one above; you can see more of his work in his DeviantART gallery or on Instagram. Chicago artist Edward J. Cabral uses a variety of media in his art, including cakes, candy, silicone—and, of course, pumpkins. Many of his jack o'lanterns are recreations of famous works of art, like Grant Wood’s American Gothic, Jacques-Louis David’s Napoleon Crossing the Alps, and Hokusai’s The Great Wave off Kanagawa (above), which he created for the 2013 Louisville Jack O'Lantern Spectacular. Check out more from Cabral at Instagram. Alex Wer, a.k.a. The Pumpkin Geek, makes jack o'lanterns that last forever—he carves pop culture portraits on synthetic GEMMY Craft pumpkins, which are made of foam. Daryl from The Walking Dead is just one example; you can see his other work here. Most of the time, Jon Neill is doing prop and creature creations for TV shows and movies—but when October rolls around, he becomes the Pumpkin Guru. The sculptor prefers to work with giant pumpkins, which means means hitting the gym. “You need good core strength and endurance in your shoulders because you have your arms out in front of you all day long pulling through material,” he told Instagram's blog. Using customized tools, Neill carves the massive pumpkins in front of a live audience. “In America, everyone has carved a jack-o’-lantern, and they all have a family experience which is repeated year after year,” he said. “I am taking this experience everyone is familiar with and I’m turbo-charging it.” See more of Neill’s work on Instagram. When Sean Fitzpatrick sculpted a snowman for his then-3-year-old daughter after a Nor'easter, he couldn't have imagined it would be the beginning of a career. It wasn't until he was building a sand sculpture on family vacation and looked up to see a crowd watching him that he realized he might be able to make a living this way. He launched his business, Fitzy Snowman Sculpting, in 2000; these days, he sculpts in sand, snow, ice, and, yes, pumpkins. He'll carve anything a client could want into a pumpkin, including logos and portraits. Behold the face of Breaking Bad’s Walter White embedded in a giant pumpkin! See more of Fitzpatrick’s carved pumpkins in his gallery, and at Instagram. Scott Cummins is an artist and art teacher based in Perryton, Texas, who taught himself to carve pumpkins the old fashioned way: by practicing. (That's his advice for aspiring carvers, too: "Practice, practice, practice," he writes on his website. "I can say that if you have no experience with carving and sculpting, I would recommend another material other than pumpkins to start with.") Cummins uses knives and clay ribbon tools to sculpt his expressive pumpkins; you can see more of his work in his Facebook gallery. Marc Evan and Chris Soria met in the sixth grade, but it wasn't until they were attending art school together in New York City—and working at bars and restaurants to pay the bills—that they started carving pumpkins. Initially, Evan told Priceonomics, it was simply "a fun thing to do to get some decorations up for Halloween. But we kept wanting to push the envelope.” Within two years, they were carving intricate pumpkins and, in 2008, founded the Brooklyn-based company Maniac Pumpkin Carvers. During autumn, they and their team spend 18 hours a day fulfilling commissions. See more of their work on Instagram, and read their tips for carving a better jack o'lantern here. 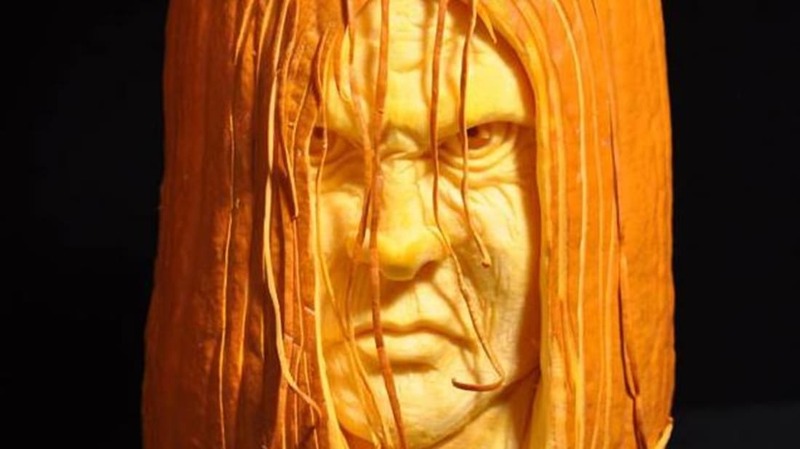 New York native Ray Villafane began carving pumpkins after he moved to Bellaire, Michigan in 1993 to become a teacher. Though he initially carved with his students, it wasn't long before he was getting professional commissions; these days, there's a whole carving studio that bears his name. Villafane and his team don't just create intricate pumpkin portraits—they'll carve whole creatures out of the gourds.